Middle School Graduation Medals are lasting symbols of achievement and serve to bring back great memories from your middle school years. 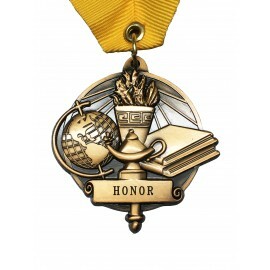 Often compared to honor stoles and cords, graduation medals represent major accomplishments for deserving graduates. Gradshop's amazing line of customized graduation medals may be ordered online from Gradshop.com. You may also avail our huge discounts if you're looking to purchase larger quantities of Middle School Graduation Medals and other outstanding graduation medals in our selection. Get in touch with us today to learn more about our top quality graduation medals.